Fascination Holding Hairspray ensures that your style stays put no matter what you do! This innovative holding hairspray provides strong support for your hairdo without leaving any sticky residue and enhances the natural luster of your hair. Packed full of nourishing Dead Sea minerals and brimming with fragrant, beneficial oils of peach, olive and jojoba, you can be sure that underneath your stunning style, your hair is cared for and protected from the elements. 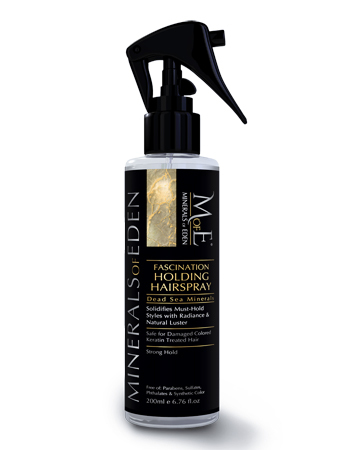 Fascination Holding Hairspray won’t let you down, promising strong hold and high-shine always. SD Alcohol-40 (Alcohol Denat. ), Water (Aqua), Acrylates Copolymer, Triethanolamine, Sea Salt (Maris Sal), Phenoxyethanol, Ethylhexylglycerin, Olea Europaea (Olive) Fruit Oil, Linum Usitatissimum (Linseed) Seed Oil, Macadamia Ternifolia Seed Oil, Prunus Persica (Peach) Kernel Oil, Simmondsia Chinensis (Jojoba) Seed Oil, Fragrance (Parfum). Apply Hair spray at a distance of appx 25cm (10 Inches) from hair to solidify the desired style in place.